For Stasia Lopez, a student in WMU’s Master’s program in Higher Education and Student Affairs (HESA), her university experience has taken her on unexpected paths, with surprising rewards. Stasia began her undergraduate study at Robert Morris University (Pittsburgh, PA), studying Business Administration with a concentration in Hospitality and Tourism Management. But a desire to break out of familiar places led her to study abroad, first visiting her extended family’s home in Greece and then journeying to Rome, hoping to trace her own roots in both countries. At the start of her trip, Stasia chose not to call or contact her extended family; from Greece, she simply hopped on a boat for the twelve-hour journey to the island of Kalymnos, her ancestral home. Miraculously, after wandering through streets and finding her maiden name (Diamantis, Greek for “diamond”) plastered everywhere, she located her relatives within mere hours of getting off the boat. Beginning a life-changing and vastly rewarding experience, Stasia continued her pilgrimage, arriving in Italy days later. While taking Italian language and culture classes at the American University in Rome, Stasia made Italian friends who helped her to discover much more about the city and its hidden treasures – off-the-beaten-path cafes, shops, and nearly forgotten landmarks and spaces, as well as new Italian friends and families – than she would have discovered among her enclave of American peers. From learning to think and speak in another language to navigating an ancient city, Stasia recalls that there was never a dormant moment for her… she felt completely alive, captivated, and challenged the entire time. When Stasia returned stateside in 2008, she found a seismic shift had occurred in her life, with her goals and outlook completely changed. She observes that “when you can foster relationships with anyone, especially international friends, who can tell you about differences in culture, perceptions, and perspectives… it breaks you out of thinking that your home is the only way to live and you see a wider swath of the world, or the world from another viewpoint.” This experience also changed her career path; when Stasia returned, she turned down a marketing internship to intern in the Study Abroad Office at her alma mater. Her experiences abroad and in that office blossomed into an advocacy and love for education that she continues in her work as a graduate student at WMU. As a graduate assistant in Career & Student Employment Services (CSES), Stasia plans a variety of programming at WMU. 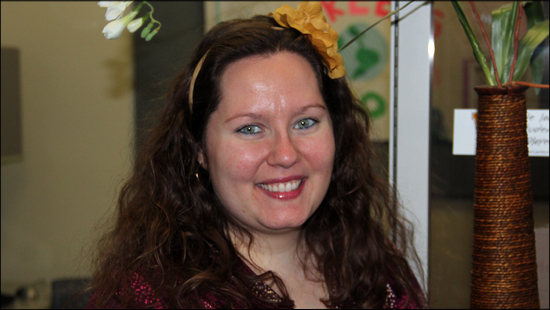 In fall 2012, she helped to open the Career Zone in Ellsworth Hall, which offers individualized drop-in and group advising. According to Stasia, “the career advising offered by CSES helps all students in what they can do with their majors, writing their cover letters and resumes, and also provides one-on-one career counseling with our doctoral students. Additionally, we also help students in planning for jobs and internships and have assessment resources to help match students with careers and internships.” Stasia finds that some of her most rewarding work comes in advising first-generation college students. As a first-generation college graduate herself, Stasia understands the importance and difficulty of balancing work, school, and life, and completing a degree program quickly, issues of special concern to this group of students. After completing one of her program internships in the TRIO Student Success Program at WMU, which primarily works with first-generation students, she realized more than ever how much she loves academic advising, especially first-generation and exploratory advising students. Hoping to pursue a career in Study Abroad herself, Stasia has advocated that this life-changing experience be available for students of all backgrounds. In 2009, she created a Facebook group called the International Cultures Group to inform a global audience about the benefits of international study and perspectives. From the start, she posted serious statistics about international cultures and Study Abroad programs alongside fun posts about foreign food, world holidays, and mini-celebrations. Her audience on the site grew to almost 400 and, last year, Stasia was nominated by GoAbroad (one of the leading websites concerning study / intern / volunteer / work abroad) for its 2012 Innovation Award for the site she created. Not content to rest on her laurels, Stasia has continued her advocacy as a writer for sites like Wandering Educators and Go Overseas; she has also attended several regional NAFSA (Association of International Educators) conferences and has applied for grants to attend many of them, the first with her work for the online resource AbroadScout. Stasia currently balances these activities with her coursework in HESA, her work in CSES, and four internships, one of which involves creating a series of workshops on re-entry for all WMU students returning from their study abroad experiences. While she feels she has found her voice and purpose in advocating for international study, she sees her life coming full-circle in her work. The first of her family to graduate from college, she was also the first to make it back to their ancestral home. Finding that her life changed and her eyes opened by this experience of traveling abroad, she now helps other students to navigate the life-changing and eye-opening experiences of higher education, and advocates the importance of new perspectives and adventures for all of her peers at WMU and beyond. This entry was posted in Graduate Student Achievement, Snippets by GradStandard. Bookmark the permalink.